An international team of researchers noticed what seemed to be a paradoxical pattern in Nepal's Chitwan National Park. 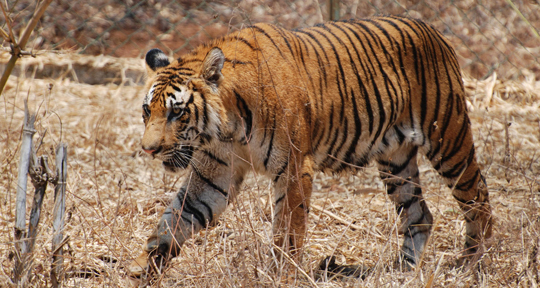 The reserve supports a healthy population of tigers, as well as abundant and ubiquitous human activity. Yet, interactions between humans and tigers are relatively rare. The study, published September 4 in the Proceedings of the National Academy of Sciences, revealed the park's tigers were more active at night when humans were not around. Chitwan is home to about 121 tigers. People live on the park's borders but venture into tiger territory to forage, hunt, and collect firewood. The park is also frequented by a growing number of tourists and by military units that pass through the park's narrow roads to prevent poaching. People and tigers compete for some of the same resources, primarily space. But the two species are wary of each other and tend to avoid interacting if possible. The researchers set up motion-detecting cameras in and around the park. The images they collected over two years showed that people and tigers completely overlapped in space, walking the same roads and trails. People used the paths during the day, but tigers, which are normally active during the day, switched their activity to the nighttime. The same cameras that captured images of people traversing the park in daylight also captured tigers at the exact same locations under the cover of darkness. This study shows people and tigers can coexist and use the same spaces. Learning to share space with people is critical for the world's remaining tiger population. The results challenge the conventional wisdom that tigers or other large predators cannot coexist with people. In the past, this way of thinking has led to people being relocated to create human-free space for wildlife. However, this study may be an indicator that such drastic solutions are not necessary, as long as human needs are balanced with the needs of tigers and other wild animals. PNAS: "Coexistence between wildlife and humans at fine spatial scales"